"Fastnet landing nets are simply the best landing nets I have used in over 20 years of guiding and teaching people to fly fish. The framework is lightweight and extremely durable, with overall build-quality that is second to none". 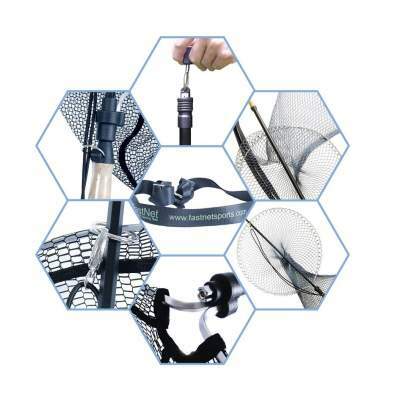 "With our time-served engineers and craftsman machining, moulding and hand-finishing each component you can rest assured that your landing net will perform beautifully in the field." "The net itself I have to say that it is perfect. When I first received the net I was a little worried that it may be too soft, however, it has proved to be excellent. This is the best gye net I have ever used. Many similar nets out there tend to stick when sliding the net along the shaft, the Salmon Gye Landing Net I purchased has never had this problem. It is a perfect net for the roaming angler. I tend to walk at least three miles on each fishing trip, and by using the quick release peel sling I have found that it can be carried easily all day long. The 26" round rim provides a practical size both for walking with the net and for landing those larger fish. The net is superbly strong, which is essential when fishing a small but very rocky spate river. I would personally give 10 out of 10 for construction and practicality. I have another gye net in the shed. It lasted half a season, has a broken rim and is jammed on the shaft, so thank you for such a superb product." "I am very happy with my Salmon Gye Landing Net. I caught a 16lb salmon on the river Moy in August 2010, and landed him on my own whilst on a high bank above the river without any problems. The net does not look as strong and robust as it is. It is also very light and easy to carry for hours on end; one happy customer."